Adobo is a Spanish word meaning seasoning or marinade. It is a very popular dish here in the Philippines and I learned how to cook it from my husband's lola [grandmother]. 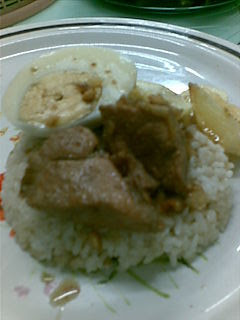 In the old times, adobo was cooked only with either pork or chicken or a combination of both. Nowadays, adobo is prepared with almost anything; fish, mushroom, meat, vegetables and now popularized by some gourmet restaurants, the Balut [embryo]. My lola's way of cooking it is by first marinating the meat with garlic, vinegar, soy sauce, peppercorn and bay leaf for a couple of hours. Then she lets it simmer until the meats are tender. When the meat is done, she lightly browns them in a separate pan followed by the sauce. Marinate the pork in vinegar, garlic, salt and bay leaves for 2 hours. Simmer until the pork is cooked through, about 20 minutes. Remove pork and set aside liquid. Add the oil and fry the pork. Pour the set aside liquid. Sprinkle with fried garlic and boiled eggs. yun palang tag sa bago ko na lang gagawin sorry kung late na. your lola seems a great cook.i'll be trying this one. Ops, love the new layout you have here the banner is great actually everything here is great. Nice blog you have here! I love adobo, but I can't just imagine how Balut adobo would look or taste like! It look so tempting! I have my endeavours with Spare Ribs in Black Bean Sauce weeks ago, and it tasted great too!